Our purpose is to enable nonprofits, startups, and a variety of innovative businesses to focus their energies exclusively on their mission without the burden of operational overhead. Our event venue offerings are a great way for us to relieve some of those burdens. With our versatile space, we are happy to work with you to make your event a success! To inquire about hosting an event in one of our spaces, please fill out the Event Request Form. For general questions, email events@miami.cic.us or call 305-503-7751. Our largest event space is 1,700 sq ft and has a capacity for 250 people in auditorium style seating. With the entire right wall covered in glass, the room lets in plenty of natural light and is great for energizing your guests. In addition, the space comes alive a mural installation of the Everglades by well-known local artist 2Alas. We have 180 chairs and over 10 tables that are accessible for use in the space. Complete with a riser, high top chairs and tables, 4 handheld microphones, a projector, speakers, and AV cables- Everglades is the perfect location for your unique event setup. 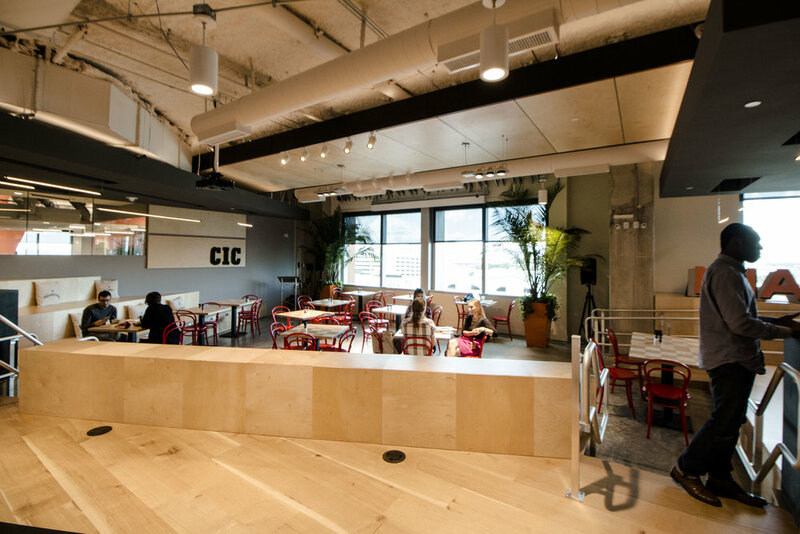 Our Cafe space is arguably the most beautiful feature of CIC Miami. We recommend this space for smaller, more intimate events. By hosting your event here, you have access to all AV equipment as well as a bar and unique multi-level seating. We have hosted events ranging from panel discussions, workshops, luncheons, and small scale graduations in the space. The Cafe’s capacity is 75 seated and 200 standing. Align with the CIC mission to help solve the world’s problems through innovation. We are happy to share discounts for events that share this particular philosophy. Are open to the public and charge a nominal or free admission. Bringing more people into our space is always a good thing! Are hosted by a nonprofit or volunteer organization. We understand that budgets can be tight, but we’d still like to help you have an amazing event for your organization. Are organized by a former CIC client. Are you an old friend? We’d love to have you back for an event at CIC! Onsite parking is available. Please note that event host and attendees must pay for their parking at the pay-on-foot station located in the lobby.